This week the Senate may vote on a bill sponsored by Senators Graham, Cassidy, Heller, and Johnson that would entirely eliminate funding for the Affordable Care Act’s Medicaid expansion and private insurance subsidies in 2027, in addition to making massive funding cuts to the broader Medicaid program. The bill would especially harm state budgets and coverage rates in states like California that have maximized health coverage gains under the ACA. It would reduce federal funding to California by $53.1 billion in 2027 alone, according to new estimates by the California Department of Health Care Services. We recently estimated that 6.7 million Californians could lose coverage under the bill. Especially hurt by this job loss would be the parts of the state with the highest ACA enrollment, including the Central Valley, Imperial Valley, and parts of Los Angeles. Click on the yellow map image to jump to interactive maps showing projected job losses for California’s medium and large counties and all congressional districts under Graham-Cassidy in 2027. Statewide, the job loss projected under Graham-Cassidy is equivalent to a 3.4% decrease in the number of jobs California is predicted to have in 2027. For context, this ranks between the jobs lost in California during the worst of the 2001 and 1990 recessions, 1.8% and 4.1%, respectively, according to estimates by the UC Berkeley Center on Wage & Employment Dynamics using Current Employment Statistics. Though our estimates focus on 2027, the job loss under Graham-Cassidy would phase in over the next decade, beginning in 2018 with the anticipated destabilization of the individual market and resulting loss of coverage due to the repeal of the individual mandate. The job loss would accelerate in 2020, when the federal funding that California would otherwise receive under the ACA would be converted to a block grant and reduced and when the caps on federal spending per Medicaid enrollee would commence. The job loss would grow further in 2027, when the block grant funding that replaces the Medi-Cal expansion and the subsidies through Covered California would be eliminated completely. Most of the lost jobs—320,000—would be in the health care industry, including jobs at hospitals, clinics and doctors’ offices, labs, other health care settings, and insurance companies. Nursing home and home care workers would also be at risk of job loss because the Graham-Cassidy provisions capping federal Medi-Cal spending per enrollee would apply to seniors and individuals with disabilities in addition to children and other adults. The projected loss in health care jobs reflects the elimination of some jobs that exist today and fewer new jobs created due to slower-than-expected job growth. The health care industry is an important segment of the California economy with nearly one in ten jobs. The industry has been a significant source of employment growth since the start of recession, in part due to the increased demand for health care services under the ACA. A number of health care occupations offer wages that support middle-class families. Hundreds of thousands of hospital, clinic, nursing home, and home care workers in the state are represented by unions. Employment in non-health care industries would be reduced by 230,000 jobs due to economic spillover effects. In particular, job loss would be most likely to occur at businesses that are suppliers of the health care industry, such as food service, janitorial, and accounting firms, and at local businesses at which health care workers spend their income, such as restaurants and retail stores. These are net job loss estimates and reflect that the loss of 580,000 jobs due to the eliminated health care spending would be minimally offset by economic gains from the repeal of certain ACA taxes, which would add 30,000 new jobs and keep an estimated $4.3 billion within the state. Graham-Cassidy would repeal the penalty some individuals pay for not having insurance, the requirement that large employers offer affordable health insurance to their full-time employees or pay a penalty, the medical device excise tax, and certain provisions related to Health Savings Accounts. As a result, certain California households and businesses would have additional income, leading to some increased spending and additional jobs in their local communities. The impact is limited, though, for two reasons: the value of the tax and penalty repeals is substantially less than the value of the health care spending cut, and health care spending cuts have a more severe impact on jobs than equivalent tax increases. If Graham-Cassidy is enacted, not only would Californians be justifiably anxious about losing their health coverage, they would also have good reason to worry about losing their jobs. Scroll over your county to see how many lost jobs would be projected. To zoom into a particular area, scroll over any part of the map until a magnifying glass appears, click the magnifying glass once to activate zoom, and then double click the area you would like to enlarge. Notes: Job impacts are rounded to the nearest 100 jobs. Eastern counties include Alpine, Amador, Calaveras, El Dorado, Inyo, Madera, Mariposa, Mono, and Tuolumne. Northern counties include Butte, Colusa, Del Norte, Glenn, Humboldt, Lake, Lassen, Mendocino, Modoc, Nevada, Plumas, Shasta, Sierra, Siskiyou, Sutter, Tehama, Trinity, and Yuba. 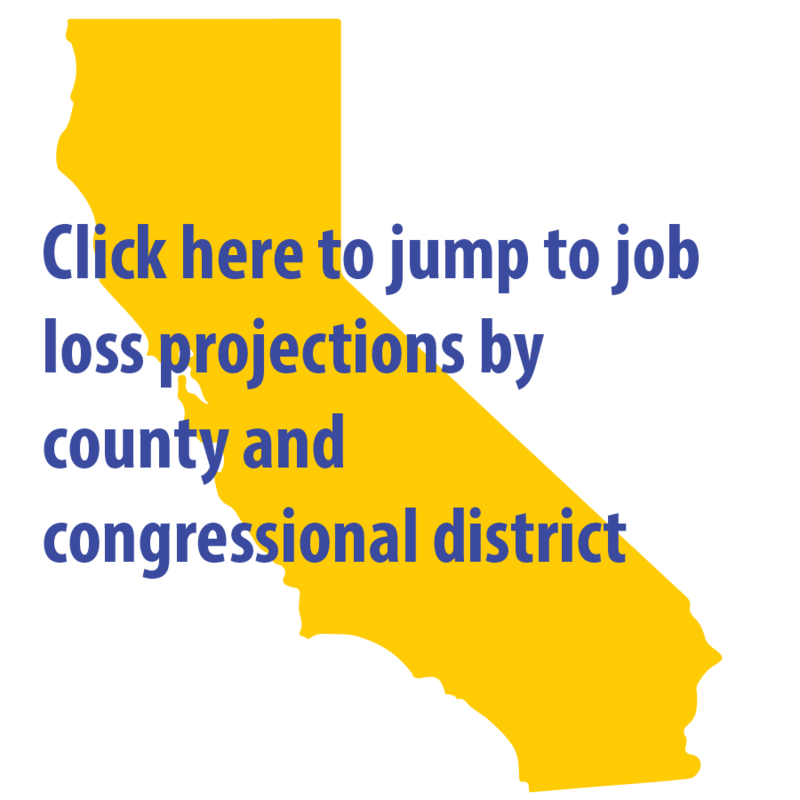 Scroll over your congressional district to see how many lost jobs would be projected. To zoom into a particular area, scroll over any part of the map until a magnifying glass appears, click the magnifying glass once to activate zoom, and then double click the area you would like to enlarge. This analysis is conducted using IMPLAN, an industry-standard input-output economic modeling software package, and follows a methodology that is similar to that of an analysis we published in December 2016 on the economic consequences of an earlier ACA repeal bill. We focus on the economic impact of the change in federal spending and tax revenues because these dollars are coming from outside the state’s economy (or are leaving the state economy) and the changes in federal spending and tax revenues are relatively predictable. However, this analysis does not include other potential effects on the economy, both positive and negative, that are more difficult to predict and model. This analysis does not include the projected loss of coverage and subsequent reductions in consumer health spending related to the bill’s provisions to repeal the employer mandate and allow states to waive certain protections for people with pre-existing conditions. This analysis does not include the potential economic harm from reduced productivity among workers who would become uninsured as a result of the bill. This analysis does not measure the economic effects of any increases in medical debt, medical bankruptcy, or other financial insecurity among households that would lose coverage under the bill. Any long-run effects of a projected reduction in the federal deficit under the bill are not included in this analysis. The projected reduction in federal health care spending modeled in this analysis was based on estimates by the California Department of Health Care Services (DHCS). DHCS’s estimates fall roughly in the middle of estimates for 2027 by Kaiser Family Foundation, Avalere, and the Center on Budget and Policy Priorities, which are all within a similar range. Eight percent of lost federal health care spending is allocated to IMPLAN Sector 432 “Insurance Carriers” to reflect administrative spending in Medi-Cal and in the average individual market plan. Fifteen percent of the non-administrative spending is removed from the analysis to reflect spending on drugs and durable and non-durable medical equipment, since those types of health care spending are likely to have a smaller economic impact locally compared to other healthcare spending which tends to be more local and pays for services that are more labor-intensive. This is a conservative assumption given that these types of health care spending have some impact on all local economies (supporting pharmacist and pharmacy technician jobs, for example) and that a number of drug companies are based in California. The distribution of this health care spending is weighted across these nine sectors according to the relative share of spending in the population, using National Health Expenditures data. The distribution of spending also takes into account the variation in spending patterns by age (non-elderly versus elderly) and the expected age of those would lose coverage. The estimate of lost health care jobs statewide is distributed by county and congressional district based on our recent estimates of lost coverage under Graham-Cassidy. The estimate of jobs gained due to the repeal of the taxes and penalties is distributed based on population. Will the new GOP health-care bill be devastating to San Joaquin Valley residents?